I've been watching and hoping to catch a few pollinators buzzing around Baptisia australis! Today I was rewarded, when this busy Bumble began working its way from flower to flower to flower. What was most astonishing, and I so wish I had been able to capture the images, was watching the Bumble work. She landed on each flower and with her back legs pushed open the petals in order to give her room to reach inside with her tongue to drink the nectar. I've shared with you that long and short tongue bees visit plants; well, this is a plant that is pollinated by bumbles and other long tongued bees. It was the first time I saw how clever these critters are when trying to get at nectar. It was a marvelous dance to watch. Her pollen baskets are filled with orange Baptisia pollen! Just look at the pollen that's been collected. She'll take it back to her nest to feed her young, while she feeds on the nectar to maintain her energy for her sunup to sundown job. Watching her buzz from flower to flower drove home how important it is to plant in drifts. The plants are right there all together and make it easy for bees and other pollinators to do their job~pollinating those flowers! Baptisia with it's mass of blooms is its own drift. But, if you have the space plant more. Baptisia australis is a Central Basin native that is happy, happy, happy in my garden! That makes me happy! I love this plant. Love how it looks like a shrub, but, is a herbaceous perennial. Love the trifoliate leaves that remain good looking all season long and add a much needed different leaf shape to my garden. Love the tall flower racemes that bloom for a few weeks, then turn into the most marvelous charcoal colored seed pods. Love that bumbles and other pollinators visit. I so love that it is a host plant for Skippers and little hairstreaks, but, is not tasty to mammals and rodents! Commonly known as Blue Wild Indigo or Blue False Indigo, Baptisia is a herbaceous perennial in the pea family. It is native to much of the central and eastern North America and is seen in gardens almost everywhere. Blue Wild Indigo prefers full sun, average to well drained soil and is drought tolerant. The blue flowered plants do well in neutral to slightly alkaline soil. Yellow and white Wild Indigo prefer slightly acid soil. Baptisia Starlite Prairieblues™ from Chicagoland Grows is one of my favorite of the new hybrid baptisias. The flowers are a gentle bi-colored periwinkle blue that looks beautiful with the pinks and lavenders of the Garden of Benign Neglect. The stems arch rather then stand tall and they require excellent drainage. Which is always a challenge here. Don't you love Spring! I'm so glad you stopped by to help me celebrate wildflowers and to continue our conversation about pollinators. I'll be celebrating wildflowers everyday this week along with Frances of fairegarden and anyone else who wants to join the party. Post anytime this week~or everyday. Let's just celebrate! and, never, never, never, ever, use pesticides in your garden. I've had a long love affair with baptisias Gail! Getting australis to grow here has been a challenge, so I'm thrilled to see the ones I started from seed last year, and the white baptisias too, have all sprouted this spring - yay! I know it will be a couple of years before they bloom. I am hoping the cream baptisia I'm growing for Native Seed Gardeners may bloom though, since it's in it's third year now. 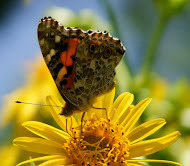 Love your pollinators/native plants posts. They're always informative, inspiring, and interesting, and the photos are fabulous, dahling! I just love seeing those bumbles with their pollen sacs filled. SWEET. My baptisia isn't blooming yet. The bumbles are fascinating to watch and always warn you of their presence with their rumble. They are having a great time on the newly opened flowers of my R. mucronulatum 'Cornell Pink'. It is perfectly pink like your phlox. I have had this plant on my wish list for some time. But after reading your post I am moving it up on the list. Looking forward to more wildflowers! What a great post. We definitely need to pay more attention to our pollinators. The Garden in the Woods, of the New England Wildflower Society, will be exhibiting a number of container plantings to attract pollinators this summer, created by the public. I can't wait to see it. And did you know that this year we celebrate Lorenzo Langstroth's 200th birthday: he invented the moveable frame beehive that beekeepers use today. 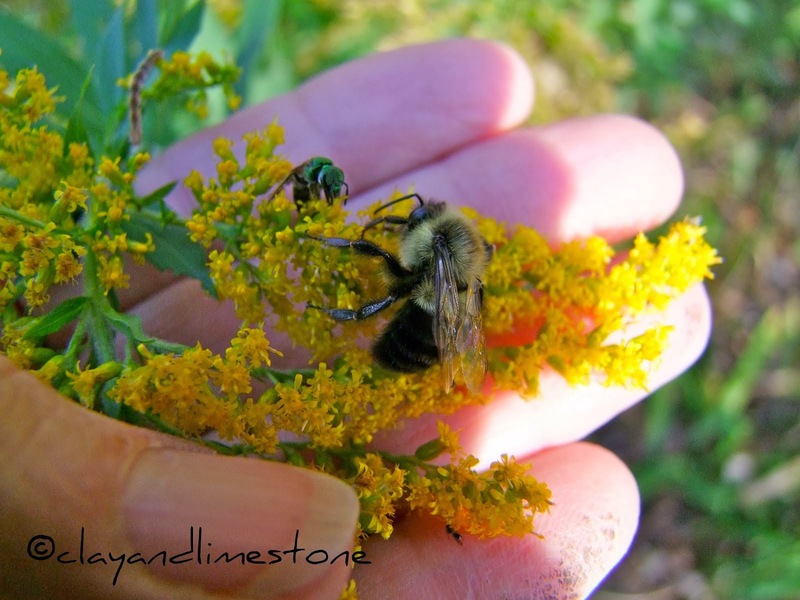 Take care of your pollinators! I love purple flowers and I have a few in my garden. But yours are so beautiful with their stems so tall. No wonder the bees love them. Im amazed how you could take the photos while it was buzzzy collecting nectar, didnt even notice you! Superb photos! Was planning on Tuesday, for your Wednesday ... flowers, butterflies and a sunbird. Thanks for indepth info on this plant Gail..Have you heard of Lupinus villosus, Lady Lupine? I will be joining your link tomorrow to chat about it. I'm still drooling over the 3rd picture ... no wonder the bees love your garden so! Your spring wildflowers are gorgeous! Baptisia is one of my favorites, although I don't have the classic B. australis (yet). My 'Carolina Moonlight' Baptisia has blooms up to 5 ft tall and is covered with bumblers.. I just can never capture them as well as you have! There's no question of Baptisia australis's pea family heritage. I almost thought in a few of the photos that it looked quite lupine-like in bloom. Planting in drifts is so important for our bee friends, as each bee has its own favorite food, and it's so much more efficient for them if they don't have to zip hither and yon to find them. Your bumble is beautiful. They really are so fascinating to watch. Once again I am wondering why there is no baptisia growing in my garden? Maybe I need to put that on the short list! I love those pea plants. Your photos are amazing! This was a great blog to look at on a rainy day. Looks like a plant I would really love here. Thanks for showcasing it. I can't wait until my Baptisias bloom this year. They are such stately plants with such great color. I didn't know that they are host plants for skippers. That's an added bonus. Gail, fabulous photo of the pollen sacks on your lovely bumble. Still no flowers here up north but I did stumble across my first bumble of the season. As I began pulling weeds he tumbled out of the dried grass, apparently taking a nap there. Picked up and placed back in a plant to come out another, warmer, day. noob here. i knew by the title alone that you must be in mid-TN. ha beautiful photos. getting some good ideas here. I started Baptisia australis from seed many years ago after seeing it in a public garden at the American Horticultural Society. It's one tough plant, and almost impossible to pry out of the ground once established. I keep admiring the named varieties on garden blogs, but so far haven't added any to my garden. Beautiful blooms of the wild. Love that little bumble. So glad I got to pet one. I love Baptisias and can never have enough. Your australis looks to be almost the same color as your iris and is a beautiful pairing. The Starlite Blues is a lovely blend of pastel colors. 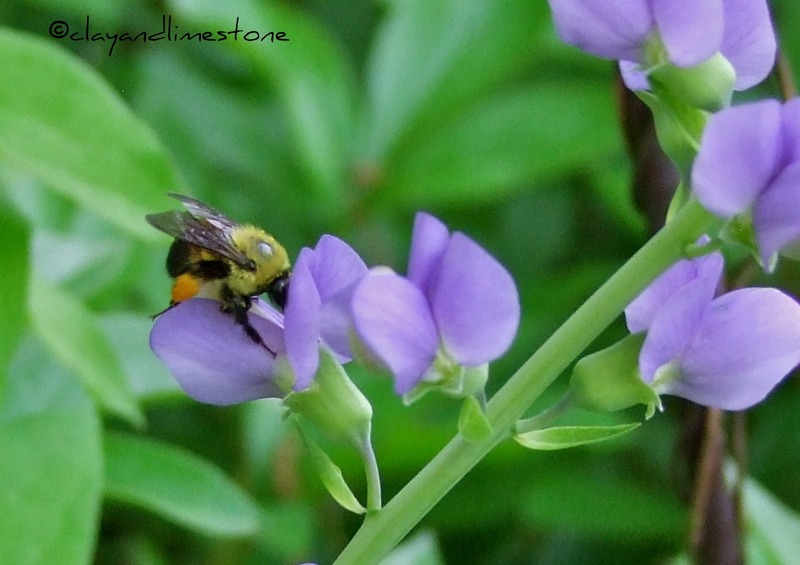 I love that rear shot of the bumblebee--it looks like he has saddlebags on his legs filled with supplies for the family:) And I do love baptisia! Mine just emerged from the ground a few weeks ago, but I'm looking forward to seeing its purple blooms very soon.